In first-person shooter Killzone 3, the Helghast are the gas-mask wearing baddies. Cloaked in black and with glowing eyes, you wouldn't want to meet one on the street. And in Munich, Germany, you won't. To help promote Killzone 3 in the German city, a Helghast cosplayer roamed the streets, complete with mask, helmet and phony gun. Cops tend to notice crap like a guy draped in black, carrying what looks like a firearm. This cosplayer wasn't just some weirdo walking around, but part of Sony's Killzone 3 hands-on promotion for the German press. It seems Sony forgot to let the police know it was showing off Killzone 3 in the middle of Munich. 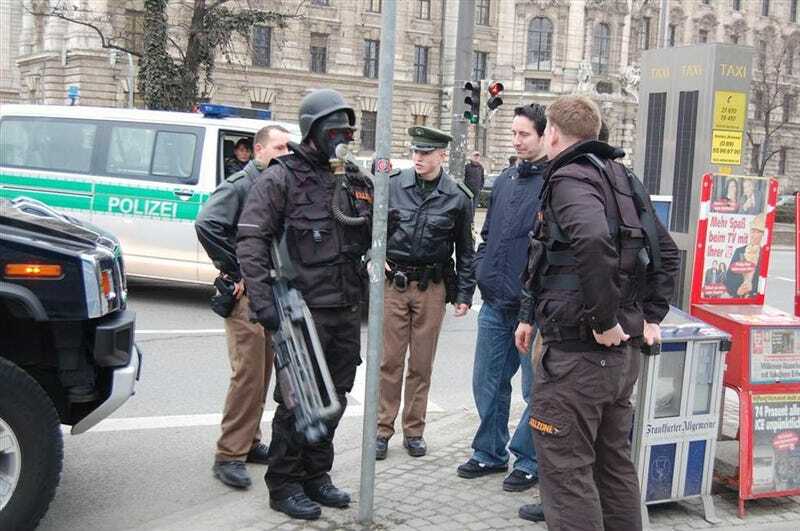 So the Munich police approached the Helghast cosplayer, trying to figure out what the heck was going on. Ultimately, the officers asked the cosplayer to remove his mask and lay down his plastic weapon — which he obliged. Normally, carrying around phony guns outside is in violation of Germany's Weapons Act and carries the equivalent of a US$13,500 fine. But this time, the Helghast were asked a few questions, and nothing came of it. Shame the in-game Helghast can't be defeated with a good talking to.